Part three of a pomegranate-themed meal inspired by 1001 Nights…see also parts one and two. My favorite cafe in Amman is Rakwa, sometimes known as “Little Jafra” (or, as I like to call it, Jufraya). It’s just off of Duwwar Paris in Lweibdeh and it can’t be beat for comfort, decor, music, food or service. My favorite dish? 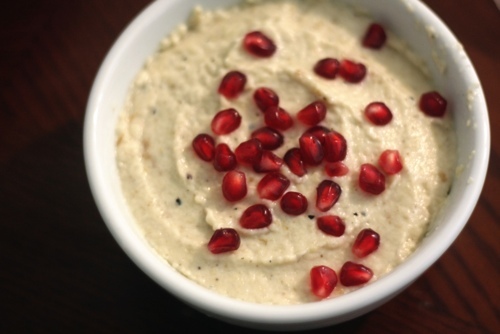 M’tabbal served with fresh, tart pomegranate seeds (you might know this dish by the name of its cousin, Baba Ghanoush). The first thing you’ll do is cut wide slices all around your eggplant, as shown in the picture. Roast them for several minutes on a gas stove, or under a broiler, turning periodically to ensure that each side is cooked thoroughly. Roast until the skin becomes soft, changes color, and begins to blacken. 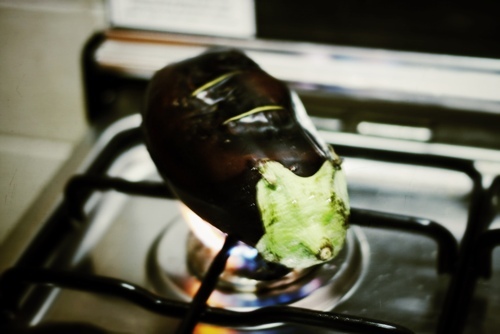 Plunge the eggplants into a bowl of cool water; once they’ve cooled down a bit, cut them open and scrape the fleshy part away from the skin. Blend the cooked eggplant with the above ingredients in a blender or food processor, adding olive oil if needed to liquefy. Adjust lemon juice and salt to taste. A spoonful of tahini is another option to add into the mix, if you prefer! Best served with a drizzle of good olive oil and a scattering of pomegranate seeds. We really love pomegranate seeds around here, so we layered the bottom of the bowl with seeds and swirled them into the middle of the dip as well. Serve with toasted flatbreads or good pita chips.